It was going to be a beautiful day in Salome, Az. The sun warmed our backs as we scurried about doing our tasks at the campground. Linda started the un-winterizing process and I cleaned and organized inside. Heidi reminded me that she was in need of a walk. We walked to the rear of the campground to exit the gate. The entire campground has a 6 foot chain fence around the parameter. We take our first walk along the edge of the Sonoran desert. I was watching for cactus and other plants that may be harmful to Heidi but what I saw was mostly sage brush. The ground was hard-packed and there were several holes probably made by some desert animals, perhaps armadillos. I headed back to campsite to help with the dumping and filling up the tank with water. Inside the camper repairs were necessary as the wardrobe closet bracket had broken and all the clothes were on the floor. The bracket that holds the clothes had pulled out of the wood from the weight of too many clothes. Linda reattached the bracket and I reorganized the closets. I folded all the heavy clothes such as pants and coats and stacked them in the smaller closet and then hung the shirts and light weight jackets in the wardrobe closet. When all the chores were completed we headed over to the bathrooms. We were pleased to see that they were super clean and the showers were great. 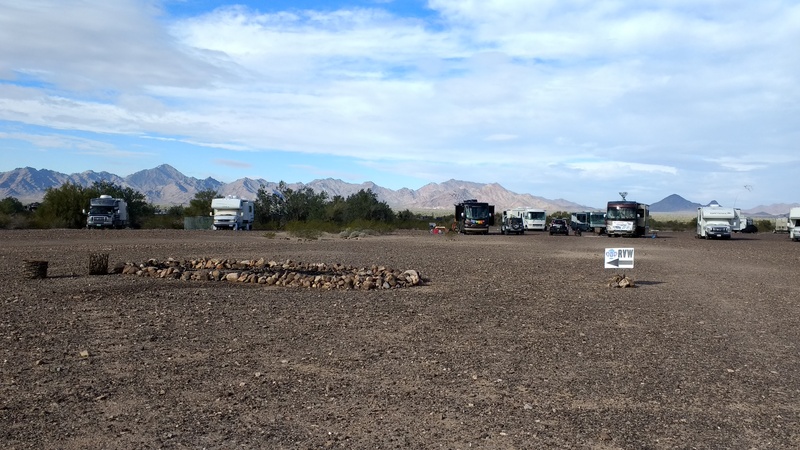 Although the campground lacked in appeal, it provided us with the services we needed. We left as happy campers and drove the last 35 miles into Quartzsite. Quartzsite is only 17 miles from the California border. It is known for its rocks, gems and minerals and has been called the “The Rock Capital of the World.” Thousands of snowbirds return every year to enjoy the warm climate. As we drive into town we are amazed at the amount of congestion. There seems to be more RV’s than cars and several businesses that cater to the RV public. 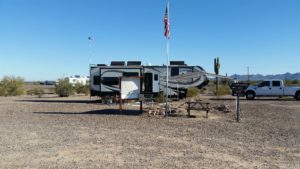 There are over 60 RV parks around town. We drive around to get oriented and stop at the Chamber of Commerce and pick up some good information and maps. We decide to drive five miles south of town to register for a 14 day permit to camp free on the BLM land. There are 11,000 acres of BLM land surrounding Quartzsite. 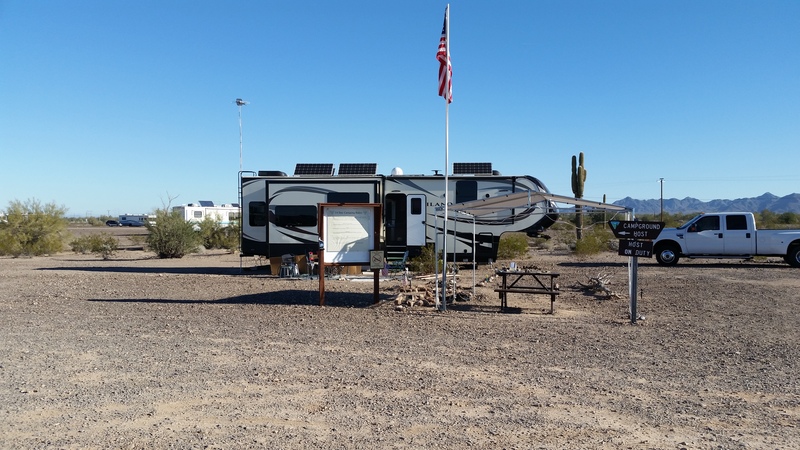 The BLM host station is simply a camping trailer with a canopy and small table to register. There were thousands of trailers and motor homes of all makes and ages spread out across the desert. 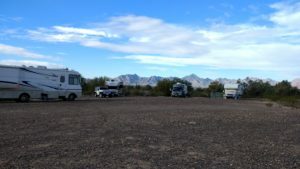 We are coming to Quartzite to meet up with a group of campers from RVing Women. It is a group for women to enjoy the RVing lifestyle with friendship, educational and rally opportunities. 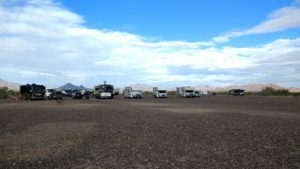 We drove around the desert for about a half hour looking for the RVW group but did not find them. 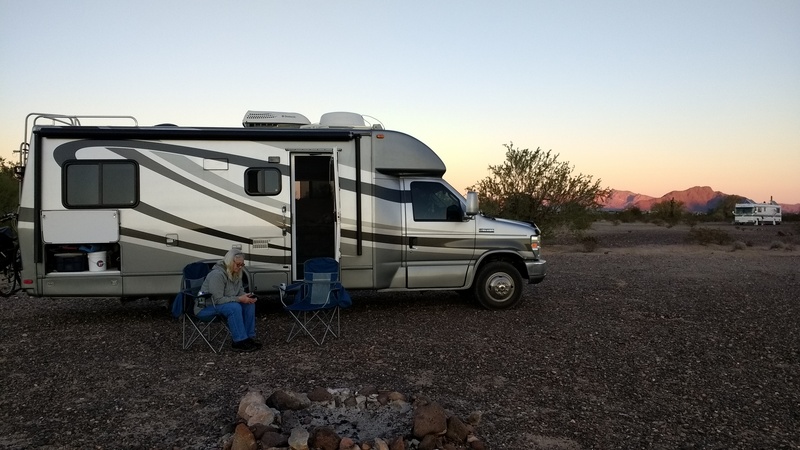 We were a couple of days early and figured they hadn’t posted their signs, so we settled in and parked the rig facing west so we could watch the sunset. We were surprised to see the best view was to the east as we watched the mountains light up from the setting sun. 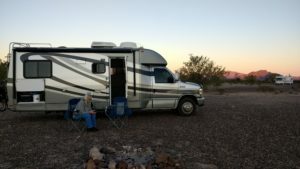 The evening chill came upon us quickly and so we turned in to spend our first night boondocking in the Sonoran desert. Our first night in the desert was quiet. Although the morning temps are in the 40’s, the sun is shining bright and it looks like it’s going to be another beautiful day. We need to make a trip into town to fill up with gas and propane. 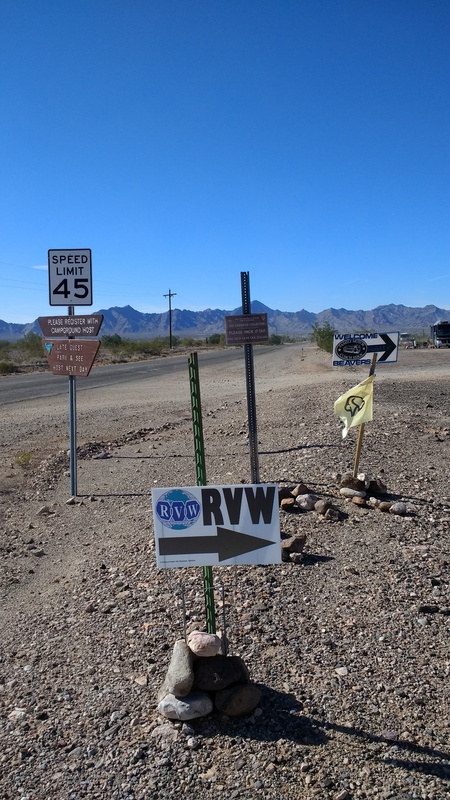 Upon leaving the desert, we see the first RVW signs. They must have posted them late yesterday after we arrived. The trip into town is 5 miles on highway 95. We drive around town to get familiarized with the layout. Although there are only a few streets, there is much congestion and many businesses clustered on each side of the streets. We fill up with gas and propane at a Love’s on the edge of town, where it is not so crowded. 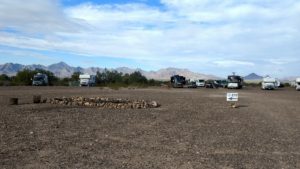 As we continue to drive around, we see the Quartzsite town park. The park has two nice dog runs that are fenced in. One run is for the large dogs and the other for small dogs. In the middle of each run is a large stretch of green grass. 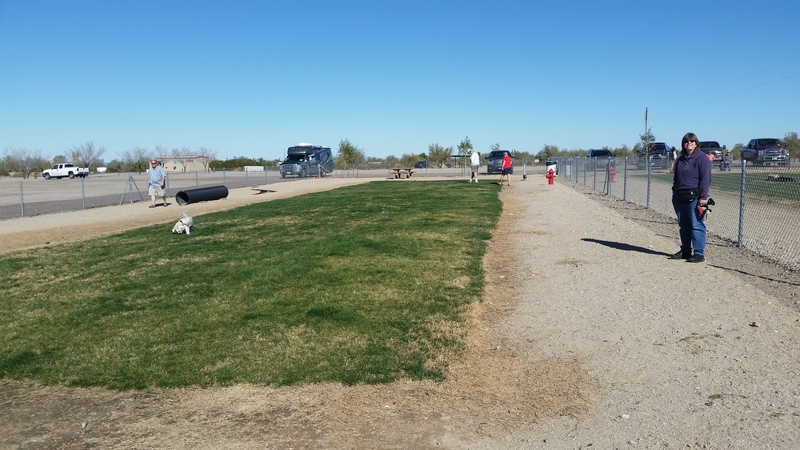 It is the first grass we have seen since we arrived in Arizona. The dog run was well-thought out as both runs have a bright red fire hydrant and some agility obstacles. We take Heidi to the small dog run and she loves it. She meets a few dogs, but is more mesmerized with all the different smells. For about a half hour she runs about enjoying all the different scents. Before leaving town, we stop and buy a box of firewood for the event. We head south on Hwy 95 back to the desert. 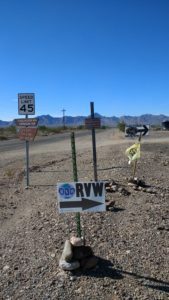 We turn on La Paz road and start following the RVW signs. We drive through the desert for about a mile before getting to the RVW group site, which is at the dead end of the gravel road. When we arrive we stop and several of the women come over to our rig. We are greeted with a very welcoming reception. We talk for a while and then pick an area where we want to park Minnie Pearl. We are the 2nd camper from the right. We take about an hour to set up camp. We put out our awning, put out the mat and set up a table and chairs. The sun feels good and temps are in the upper 60’s. We are settled in for a few days now and are excited to make new friends. There are about 40 to 50 rigs here so far. This entry was posted in Arizona and tagged Boondocking, Quartzsite, RVW, Sonoran Desert. Bookmark the permalink. Thanks, Gordon. Love having you with us! Enjoy your time with Lee and give him a big hug from the girls!